Religious education is essential to build characters of individuals. Formal Islamic education institutions, Islamic boarding schools (Pondok Pesantren) or Islamic schools, have enticed many people this recent decade. Parents are pleased that their children study and gain religious knowledge in an Islamic institution. Besides primary and secondary Islamic education, Islamic higher education also appeals a lot of people. Thousands of students enroll at a private Islamic higher education institution each year. However, the circumstance is rarely found in the east of Indonesia such Maluku Utara Province. Parents in the province are less interested in sending their children in an Islamic higher education institution due to the lack of equitable development of Islamic schools in the province. For instance, there are only three Islam higher education institutions, namely Universitas Muhammadiyah Maluku Utara (UMMU), Sekolah Tinggi Agama Islam (STAI) Babussalam Sula Maluku Utara, and Institut Agama Islam Negeri (IAIN) Ternate. The institutions are far one another that UMMU and IAIN Ternate are in Ternate while STAI Babussalam Sula in Sulabes Island. On the contrary, there are 12 Islam higher education institutions in Nusa Tenggara Barat (NTB) even though an area of Maluku Utara is wider than NTB, 31,982 km2 and 19,709 km2 respectively. Heads of Kelompok Mualaf Mujahid in Tobelo, Halmahera Utara Hj. 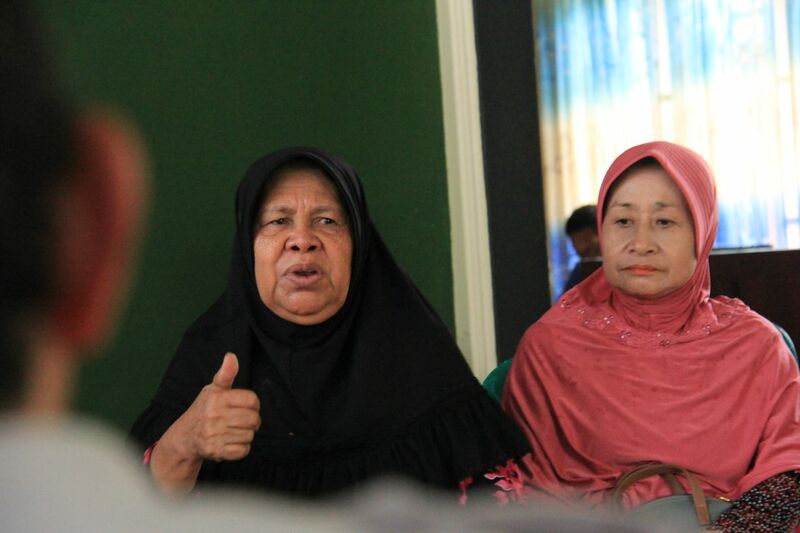 Rajiah stated that children in Halmahera Islam need an Islamic high school (SMA). “As a parent, I wish that an Islamic higher education could be established in this island since Tobelo is a big city in Halmahera Island. Thus, government or an Islamic organization of Indonesia should build an institution here,” he declared. Meanwhile, Head of Office of Religious Affairs (KUA) of Galela District Rahman Sahal, SHI. told after post an inter-ethnic conflict in Maluku at the beginning of the millennium children being victims of the conflict entail intensive and sustainable religious education. “All Indonesian people must recognize that the conflict killed thousands of children and the elderly. Our focus was maintaining mental and psychology of children who were safe from the conflict. We, then, provide sustainable religious education in formal and non-formal education,” said Rahman. He also explained why an Islamic higher education is necessary for high school students in the Island. “After graduating from high school, many children are interested in pursuing their higher education at a state or Islamic institution. Some of them went to Ternate City to study at UMMU or IAIN Ternate, but the others did not continue their study,” added Rahman. IAIN Ternate has offered distance learning in Halmahera Island comprising of five regencies, namely Halmahera Utara, Halmahera Timur, Halmahera Selatan, Halmahera Barat, and Halmahera Tengah. However, the distance learning is only for a program, Program of Islamic Studies, and is conducted once a week. Indeed, not all people can take the distance learning because it is only for civil servants. Therefore, Rahman expected that an Islamic higher education could be established in Halmahera Island, well-known as Panjang Island. A fascinating story came from the Island. It was an alumnus of SMA Muhamamdiyah Galela to save his alma mater. Rahman Sahal, SHI graduated from SMA Muhammadiyah Galela in 1994, and afterwards he pursued his higher education. Then, he has become Head of KUA Galela since 2010. “I was sad to hear about my high school,” expressed Rahman. It began in 2012 that many students withdrew from the school because of a financial issue and some teachers resigned. It occurred for two months and it got apprehensive in 2014 that the school only had one student so that the school was officially closed. As a Muhammadiyah cadre, Rahman would like to reestablish the school, but his intention did not run smoothly. “I felt that I need to do something for my alma mater. I dreamt of reestablishing the school. I was Deputy Secretary of Pimpinan Cabang Muhammadiyah (PCM) of Galela District. Therefore, I could take over SMA Muhammadiyah and I declared myself as the headmaster,” he maintained. When being Deputy Secretary of PCM, Rahman wrote a decree on his appointment as Headmaster of SMA Muhammadiyah Galela. Afterwards, he gathered teachers who resigned from the school to return and teach at the school. Eight teachers were willing to teach. Rahman, then, found students. He met students who withdrew from school. For five months, since February 2014, he successfully convinced 30 students to study at the school. “I visited their house, bought them uniform, and told them that the school was free. I also invited them to have meal together or go to somewhere if I had an event with local government. I did all of them to maintain their motivation to learn and I positioned myself as a teacher as well as a father,” informed Rahman. Rahman also expressed that school expenses and salary of temporary teachers were used his money earned from being Head of KUA. Each temporary achieved 250 thousand rupiahs per month, but I often gave it late since the money sometimes was used for other school expenses. Nevertheless, all teachers knew the school condition and they devoted their time and energy to worship to Allah. The long effort was paid off. Government of Maluku Utara Province provided financial aids to SMA Muhammadiyah Galela. Rahman also attempted that the 30 students could pursue their higher education for free at Universitas Muhammadiyah Maluku Utara. After the four-year struggle, Rahman resigned as the headmaster in 2014. He handed over the school to another teacher. The school is now attempting to achieve its target in 2019, to construct three buildings to accommodate the increasing number of students. Hence, Rahman and Hj. Rajiah expected that Islamic organizations in Indonesian and Ministry of Religion to assist the development of Islamic education institution in the east of Indonesia. Rajiah contended that religious education is significant for all people from different ages, from teenagers to the elderly. Another concern in the area is that many Muslims decided to believe in another religion, and Islamic organizations such as Muhammadiyah no longer exists. Indeed, people do not perceive significant impacts from well-established Islamic organization in Indonesia. Noticing the circumstances, we as Muslims should take roles and possess vigor and tough mentality, as Rahman, to struggle for the nation’s intellectual. It is a story from Islamic education in an area where two huge Islamic kingdoms in Indonesia reached their victory in the 17th century, namely Kesultanan Tidore and Kesultanan Ternate.